In times gone by, you either had a job or you didn't. Sure, a few people were freelancers or independent contractors, but most of us either punched the clock or stood in the unemployment line. All that changed with the the "gig economy" — that is, the advent of companies that tap into the casual or spare-time labor force, like TaskRabbit or Amazon's Mechanical Turk. When people talk about micro-job sites, Fiverr usually comes up first because it has the most buyers and sellers. This site allows you, the worker, to post a task you are willing to perform for $5. The slick interface helps you along by giving you categories to choose from. One thing reviewers like about Fiverr is that it is easy to get paid for the gigs you do. You do the job, the hirer pays you $5 within 14 days, and $4 is deposited into your PayPal account (Fiverr keeps a buck). You can make a little more money if you offer "extras" on your gig. The biggest negative people cite about Fiverr is that there are so many gigs listed on the site (20,000 offers for logo design alone), you need to find ways stand out to get anyone to choose you. On the other hand, Fiverr's popularity is also cited as its greatest strength, since there are more potential hirers here than on the many Fiverr knock-offs. I signed up (using my Facebook profile) and posted three gigs; writing a birthday poem, proofreading one page of errors, and finding a rental car deal. Posting these took me about 13 minutes total. The most time-consuming part of posting a gig is choosing and uploading the required photo. Two hours after posting my gigs, I received a request to do a job that was not exactly what I'd offered. The owner of a website wanted me to write reviews on the site and fill out an anonymous personality quiz. The task, which was mildly enjoyable, took me 17 minutes, giving me a pay rate of about $14 per hour. The next morning, I awoke to find the buyer had approved my work, left me positive feedback, and deposited $4 in my account. If I could find ample jobs like this one, I would consider working on Fiverr for an hour a day for treat money, especially if I could manage the jobs while relaxing in front of the TV. However, 48 hours after signing up, I hadn't yet landed a second gig, so it seems I would need to spend more work promoting myself to get much work on this site. Like Fiverr, you get jobs on SEOClerks by posting what you're willing to do, and waiting for someone to choose you. Unlike Fiverr, you can list any price you want. The website appears to have a lot of gigs priced at $5-$10. As the title implies, a lot of the tasks and categories on this site are related to helping people optimize their websites for search engines, but there are also non SEO-related gigs posted here, like making phone calls. It took me one minute to register using my Google account, and five more minutes to post an offer to copyedit one page for $5. Most of this time was taken up by fixing my submission to fit the site's rules and waiting for the gig to upload. After 24 hours, I had not received any orders, so I added a second gig offer. After 48 hours, I still had not received a single offer. "MTurk" is different from the first two sites in that you don't have to post a gig and then wait for someone to order it. This site has lots of tasks called "HITs," just waiting for you to do — 335,000 of them when I visited the page! That's the good thing. The bad thing about Mechanical Turk is that many of the HITs pay very, very little money. Some are surveys you can take, others require you to go to a URL and look for information. There is a Reddit forum that points out some of the higher-paying HITs. I logged in using my existing Amazon account, and spent less than one minute accepting the terms of service. Then Amazon said it needed to review my application before I could do any HITs. Two days later, Amazon sent me an approval email, and then I had to fill in my mailing address and social security number, and register for Amazon Payments. This took two minutes. For my first HIT, I chose a job that paid a whopping 11 cents: entering item numbers and prices from a long Walmart receipt onto a web form. The job was tedious and it took me 14 minutes, meaning that if I kept cranking at that pace, I might make 44 cents an hour. In my approval email, Amazon also informed me that any money I earned would be on hold until I had completed at least one HIT a day for 10 days. Since most of the HITs I saw paid from 1 cent to 15 cents, I lost patience at the idea of logging in every day for ten days, just to cash in 80 cents at the end of the experiment. Not everyone does as badly as I did. The folks at The Simple Dollar spent one hour doing Mechanical Turk tasks and earned about $7 — less than minimum wage, but still something if you are underemployed and can't find work. A couple of tips from other Wise Bread writers: Linsey Knerl says you might have more luck snagging good gigs in the middle of the night, and the enterprising Xin Lu suggests that instead of completing tasks on Mechanical Turk, you hire workers there at low rates and charge clients more money for their work. For instance, by running a transcription company. I was attracted to the idea of Gigwalk because it promises to pay for tasks you can do when out walking around. I like to walk. When this company debuted a few years ago, it offered easy opportunities like taking a picture of a store sign. Now, tasks look like they include a little more work, like checking inventory in stores, taking photos, and writing descriptions of product displays, and even setting up those displays. Once your work is approved, you get paid via PayPal. Some of the tasks stipulate that you use a high-end phone to take and upload pictures. I entered my Android phone number on Gigwalk's site and they instantly sent me the link to download the app. You can also find it on iTunes or in the Google Play Store. It took five minutes to download and open Gigwalk on my Android phone, then sign up through Facebook. The app immediately began to search for gigs in my geographic area. However, the closest one it found was 14 miles away. That gig was taking a photo of a specific display in a Best Buy store for $5. It also found a number of opportunities to check the shelves at various Walmart locations for a certain product, and snap a photo of the product on the shelf, for $2.25. The Walmarts were all 20 miles or farther from my home. This is a common problem that people run into with Gigwalk — it seems to be an opportunity only for people who spend time in large cities or live near a Walmart. Because of the distance, I didn't do any gigwalks. However, others have tried it and blogged about their experiences. AJ of Insidious Life found that the tasks offered locally were not worth the time, like setting up a Walmart product display for $12. A tip from a FatWallet forum: Look for gigs at the end of the month, when "...schedulers become more desperate and...offer bonuses." Author's note: I was planning to include Gigbucks in this list, but when I found out the web site was acquired by new management in February 2015, and that it put balances accumulated before that time "...on permanent hold, to be settled at a future date," I decided that time is needed to see if this site will be a reliable place to earn money in the future. Do you earn extra income via any of these micro-job sites? There are much more platforms besides these that are effective in finding micro jobs and consulting assignments. 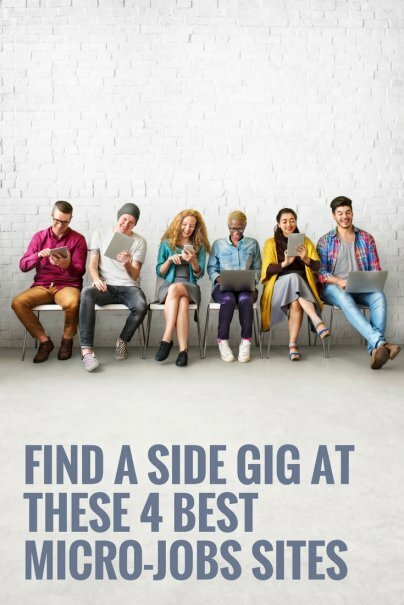 For instance teleassistants where you can find genuine work from home jobs and hourlyconsultant where you can post your gigs and get work. Good article. I have services in fiverr, gigbucks and labaulera.com (the last one don’t charge comission in the $5 usd services). Thank you for the time to write this article and sorry for my english. you helped me to filter out best of best! Thanks for sharing! I have only been using Mechanical Turk for the past month and a half, but I've made over $200. Every little bit helps! I just wanted to say thanks for your very real reviews of these services.